The event was very well organised by The Lord Mayor's Office, and attended by large numbers of spectators who behaved with total respect, especially during the two minutes silence. It was fantastic to see so many young people from the various groups. The cadets of all three branches of the armed forces, scouts, St John’s ambulance, and many others taking part in the procession, were well turned out and obviously felt the same honour we did to be there. Three children aged about eight years old (who stood very patiently waiting to lay their wreath) deserve a special mention. They behaved in a vey thoughtful manner throughout and laid their wreaths very respectfully. It was nice to see them being thanked by some of the VIPs. The weather was especially kind, early showers gave way to bright sunshine, but it was still somewhat chilly. 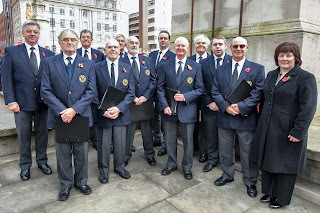 We wore our normal choir uniforms, no overcoats or scarves etc. Several members admitted to wisely wearing thermals under their white shirts. For some of our, shall we say “long serving members”, it was quite an ordeal to stand for so long, but they endured it with a good heart, especially when we were honouring those who had made the supreme sacrifice whilst serving their country. As the eleventh hour chimes rang out, very loud, all fell silent. It was very moving. As the echoes of the last chime died away, an extremely loud bang rattled nearby windows as the army fired a two inch (hopefully blank) shell to indicate the start of the two minutes silence. The only noise then to be heard was the frantic flapping of a flock of terrified pigeons, roused from their perches by the incredibly loud explosion. It was at this point we all thought headgear would be a distinct advantage! However the birds soon settled down, and silence reigned once again for the remaining minute and a half. At the conclusion of the service the parade moved off, through various guards of honour and to the applause of the spectators. The reception in the town hall, before and after the service was very good. The ancient corridors within the town hall can be a bit daunting and rather colourless with echoes to rival the Whispering Gallery! We were invited to join the veterans for a meal in the Great Hall - very impressive Gothic design! The meal was a hotpot, just the ticket in this chilly weather. It was very welcome and enjoyable. 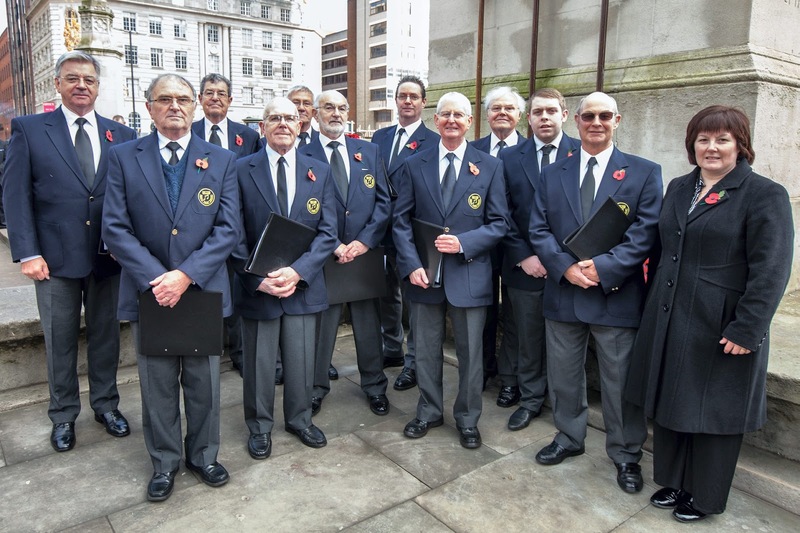 Some of the members of the choir got into conversation with veterans. Despite wearing rows of medals most of them tended to play down their roles, and counted themselves lucky to survive. We were photographed with several dignitaries: the Bishop of Manchester, the Lord Mayor and the Vice Lord Lieutenant of Greater Manchester who commanded a Gurka regiment during World War II. All thanked us for our contribution to the service. It was a privilege to have taken part.